Combining the look of the cover and the title, I was ready for a fun read about two sisters. Did I get what I expected? What I wanted? Since I don’t have a very close bond with my brother, I was immediately intrigued by the story of two sisters being estranged. Having lived apart for years and not having any contact whatsoever, I wondered how they’d pull through and how, exactly they fell out in the first place. Witnessing how they, slowly but surely, found themselves and each other was something very much worth my time. I enjoyed it all and it simply felt real, genuine. At first, I thought the major focus would be on the romantic aspect of the book and, while the men in this story are definitely pleasant enough, I was glad it wasn’t. The Sister Swap focuses on the sisters, on their growth and their journey. Refreshing is definitely the word to describe my feelings towards that. Not to mention the ending of this novel – I absolutely loved it! The settings in this novel are brilliant as well. Being out in the country, there isn’t an awful lot to do, which makes it even more fun to see how Meg – who has her own model agency – finds things she’s interested in and wants to invest time in, while Sarah takes up her old, old job as an event planner in London. And if you know me even the tiniest bit, you know I just lovelovelove London. If you want heart-lifting read, focusing on the importance of family and with a dash of romance, this is definitely one for you! And, as I did, you can take a glass of Babycham with it to enjoy it even more. If you haven’t tried this yet, you should! Sweet champagne is delicious and it really is brilliantly sweet! 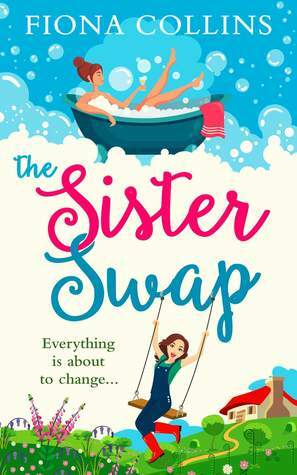 The Sister Swap released YESTERDAY, so be sure to grab yourself a copy! I know a lot of bookworms enjoy tea or coffee when they’re reading. Is there any other drink you sometimes feel like having while reading?